ISO 10816 Vibration Severity Standards Reliability Direct, Inc. Your Direct Source for Reliability, Maintenance, Test & Measurement! 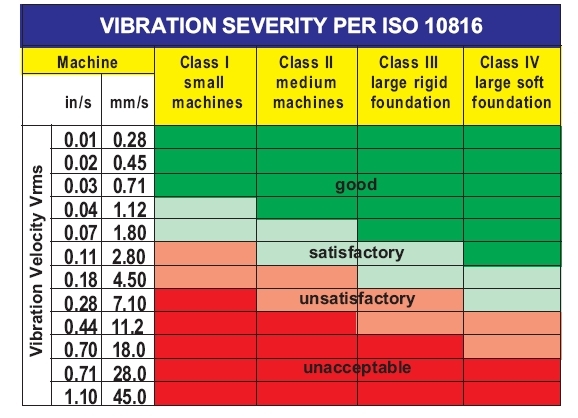 ISO 2372 (10816) Standards provide guidance for evaluating vibration severity in machines operating in the 10 to 200Hz (600 to 12,000 RPM) frequency range. Examples of these types of machines are small, direct-coupled, electric motors and pumps, production motors, medium motors, generators, steam and gas turbines, turbo-compressors, turbo-pumps and fans. Some of these machines can be coupled rigidly or flexibly, or connected though gears. The axis of the rotating shaft may be horizontal, vertical or inclined at any angle. Use the chart below combined with additional factors described in this manual to judge the overall vibration severity of your equipment. 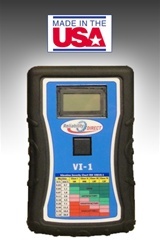 The RDI VI-1 is the easiest to use vibration meter we offer. Click here for product and ordering information.